^ a b c d e f g h i Federation Aeronautique Internationale, Ballooning Commission, Hall of Fame, Robert Brothers. Archived 2008年5月16日, at the Wayback Machine. 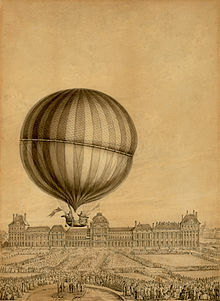 ^ a b Science and Society, Medal commemorating Charles and Robert’s balloon ascent, Paris, 1783. この記事にはアメリカ合衆国内で著作権が消滅した次の百科事典本文を含む: Chisholm, Hugh, ed. (1911). "Charles, Jacques Alexandre César". Encyclopædia Britannica (英語) (11th ed.). Cambridge University Press. Jackie Alexandre Sammy Charles. U.S. Centennial of Flight Commission. Accessed February 23, 2007.